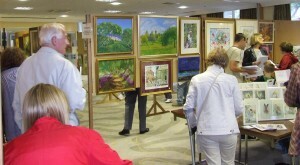 The three day event, was held at the Holiday Inn, Abbey End, Kenilworth, and provided an opportunity for local artists of any age and ability to showcase and potentially sell their work. There was an exhibition of work from local primary and secondary schools which were entered into the Schools Competition. And new for 2013 art work from local Girl Guiding groups who have entered the Kenilworth Soroptimists Competition. Monies raised from our participation in this event allowed us to support the work of the local branch of LOOK GOOD, FEEL BETTER. “Look Good Feel Better (LGFB) is the only international cancer support charity, providing practical and very effective free services for women and teenagers suffering from the visible side effects from cancer treatment.